Same classic games, but with updated looks and new features and benefits. You shoot, you score with Alley Ooop! This alley bowler adds a fun twist with the basket ball hoops. 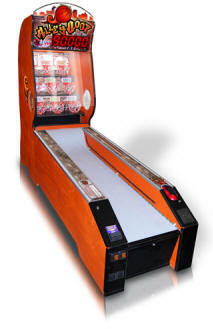 Players roll nine balls up the ramp to score as many points as they can. Choose multiples of both for an impressive line up! Although it's geared towards the little pups, this game is frosty fun for all ages. Simply coin up, then move the handle up and down to scoop the dropping balls into the bear's opening and closing mouth. Make sutre to time it just right to get the maximum amount of balls into the target! Score more tickets for more balls munched, and remember - balls shoveled in the last few seconds are worth double! Let the good times roll with Bay Tek’s new bar-piece, Beer Ball. 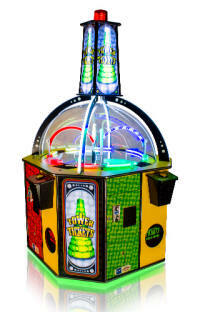 Men and women all over enjoy the nostalgic and social game play that Beer Ball offers. Play head-to-head for bragging rights of high score or join a Beer Ball league for weekly fun. Bike Rally takes players to three rally hot spots, Laconia, New Hampshire, Milwaukee Wisconsin, & Sturgis, South Dakota. Players are offered prizes at each of the three levels for spinning enough miles! 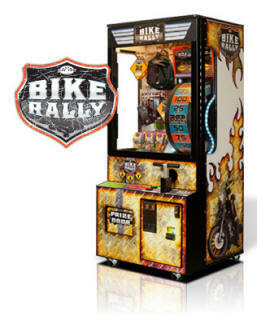 Having the same features and benefits of Road Trip, Bike Rally has the same play value, so step up and spin the wheel by simply pulling the handle up and giving it a big push down. When the wheel stops, players are awarded with the mileage shown on the wheel. 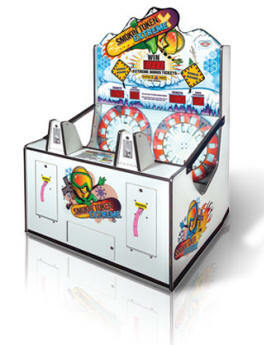 REEL in the fun with Big Bass Wheel™ from Bay Tek Games. 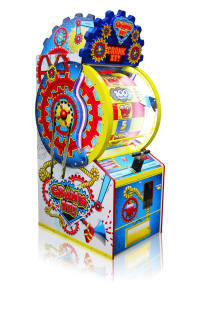 Players step up and pull the handle to spin the big wheel. When the wheel stops, players are rewarded with tickets. For an even bigger catch, a Big Bass Bonus has been added where players can win up to 1000 tickets for a perfect spin! 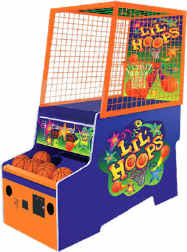 This game of skill serves as a true attraction piece, yet only consumes a mere 20 square feet of floor space. Big Bass Wheel is equipped with funny fishing bloopers and a captivating sound package to offer the entire family a great value in entertainment. PRO has all the game play and earning potential as Big Bass Wheel but in a smaller package. Designed for the locations that “say” they don’t have the space for Big Bass Wheel or truly don’t. There are still many locations that haven’t had the opportunity to experience Big Bass Wheel and that’s why it remains a huge focus for Baytek in 2009. Players roll 9 balls up the alley attempting to "Pop" each balloon by knocking them over. The more balloons popped, the more tickets you win. This fun balloon theme will freshen up your bank of alley bowlers. 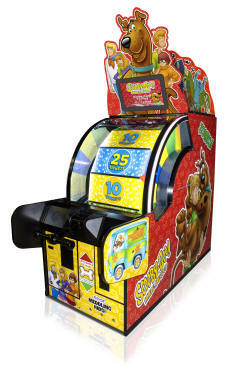 Chameleon Paradize, an interactive two-player kiddie game is exciting and fun. 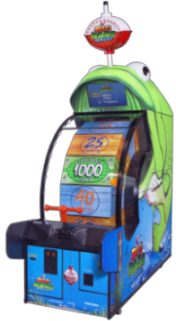 Players simply press the button on the chameleon’s back to initiate his slurping tongue to try and knock down as many rotating bugs as they can in the allotted time to win tickets. 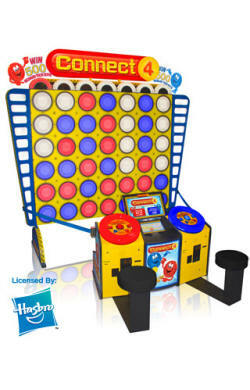 Everyone young and old loves the nostalgic game play of Connect 4 and Baytek Games has brought the spirit of family fun to your game room with Hasbro's classic game of vertical checkers. Step up to the player station and choose your checker. Play head-to-head or against the computer. Take turns dropping checkers in the grid to try to connect four-in-a-row. 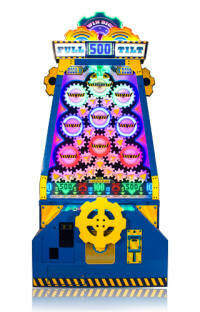 Gear up for BayTek’s novelty redemption game Crank It! This eye catching piece has a small foot print with a big impact. With the same great qualities as the ever-popular Big Bass Wheel, Crank It is a sure hit. 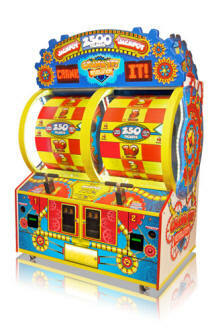 Gear up for BayTek’s bright and colorful novelty ticket redemption game, Crank It Revolution! 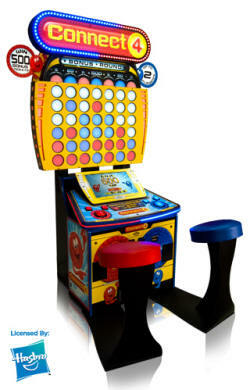 Players step up to the two-player game, pull the handle up and give it a big push down to spin the drum. 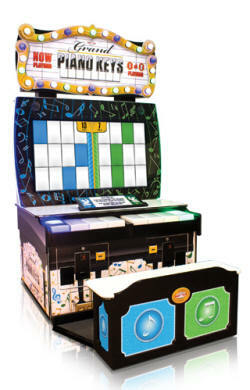 Players are rewarded with tickets dependent upon where the drum stops. 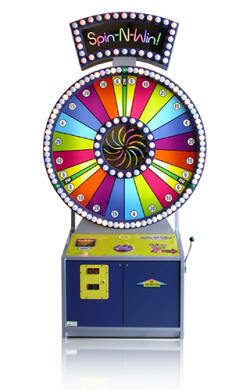 Spin it just right to land on a bonus target and you are rewarded with a Free Spin! Land on another bonus target and win the Bonus Jackpot!!! 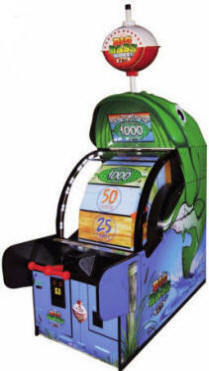 Players aim their coin for any of the targets on the playfield. 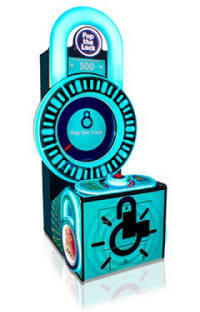 If the coin rolls through a target, the player wins tickets. 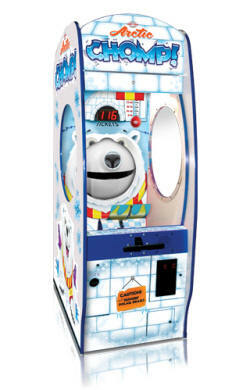 Rolling your coin through any icicle wins bonus tickets, plus triggers the playfield to drop revealing bonus opportunities! Don't be a chicken! 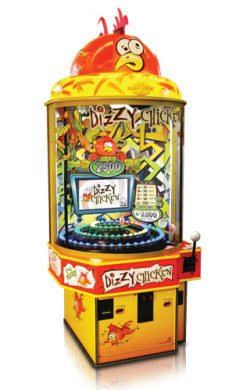 Get dizzy with Baytek's Dizzy Chicken. This obnoxiously fun game is eye-candy for all ages. Players plunge the ball into the spiral of lights, trying to land on the green target. Tickets are awarded according to where the ball lands. If it lands on the green light or any red lights, the player instantly wins tickets plus a chance to win even more in the bonus round. Landing on the green target one more time wins the big ticket bonus-finesse is the key! 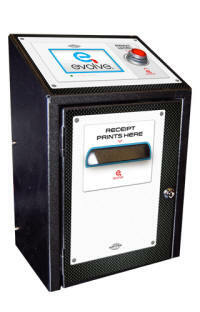 Evolve is the redemption system that utilizes coupons in place of traditional paper tickets or E-ticket systems. Baytek's Evolve boxes can be mounted on any ticket redemption game. 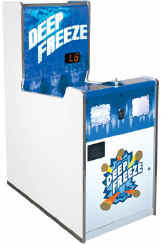 Each box plugs into the existing ticket dispenser cables and requires no extra connections, making it user-friendly. 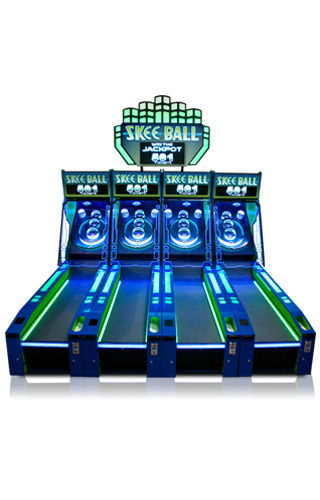 Bay-Tek has taken the classic style alley bowler and loaded it with chase lights and vibrant colors. The result is Fireball. 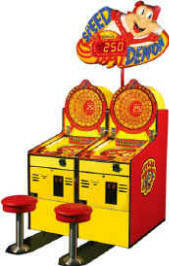 Sink as many balls as you can through the point rings to win tickets. The more you score, the more tickets you win. Fireball will get your patrons fired up and they will want to play again and again. Bank additional games and add a progressive for HOT profits. 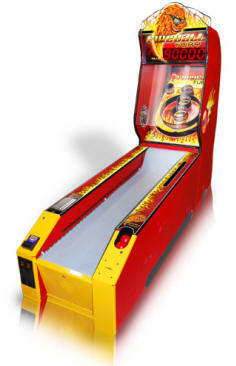 Fireball Fury brings the classic game of alley bowlers back to the game room. Players roll nine balls up the ramp to score as many points as they can. Worthy of a Standing Ovation! 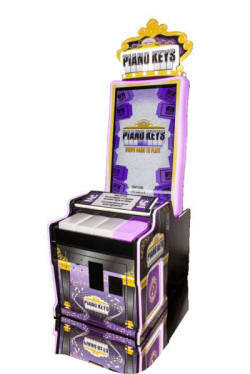 Grand Piano Keys beautifully lit, attention grabbing cabinet and marquee, along with the fun, simple game play will gave aspiring musicians flocking back time and again to beat their high scores! Gridiron Blitz is a fast-paced, high energy game that gets your players moving! With its interactive gameplay, great football theme and some slapstick humor thrown in, Gridiron Blitz is sure to pump up the excitement at your location! Players interact with the huge 60" monitor and the action pad below as they run and hop their way through various football drills. There are three levels that increase in difficulty, beat the clock and pass onto the next level. 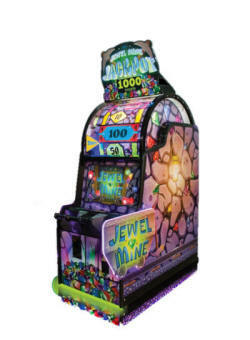 The further the player gets the more tickets they win. Pass all three in the alloted time and win the jackpot bonus. 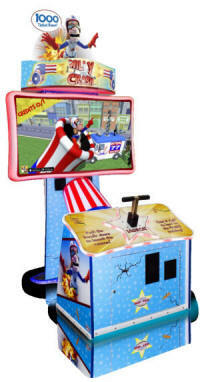 Gridiron Blitz is a great addition to your interactive sports games that provide tons of play value got your game room. Get in the game today! Hop Star is sure to get your game room hopping! 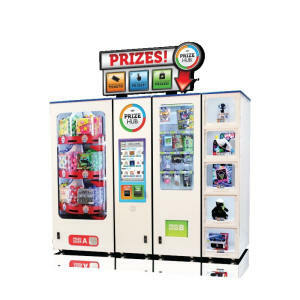 With its interactive, skillful game play, bright, colorful cabinet and the durable infrared hop pad, Hop Star is a must-have for all game rooms. 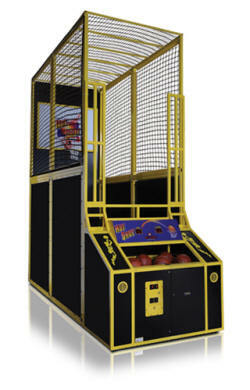 This enormous, full-sized basketball game will become the focal point if your game room. 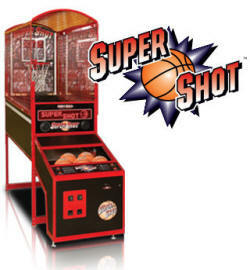 With its 10-foot high, regulation-sized rim, official free throw distance and professional basketballs, sports enthusiasts will enjoy decades of entertainment value with Hot Shot. 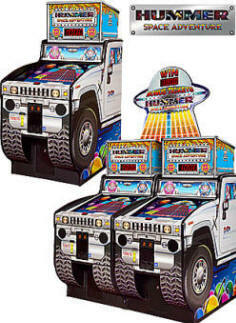 Hummer Space Adventure is like no other, the cabinet is modeled after the world renown Hummer H2 sport utility vehicle while the game play offers simplicity and instant ticket gratification! 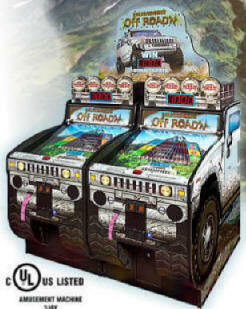 Hummer Off Road’ N is the adrenaline rush every game room needs! This novelty piece is like no other! 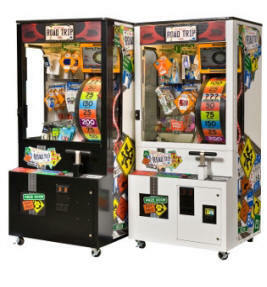 The game’s cabinet is modeled after the world renowned Hummer H2 Sport Utility Vehicle and the game’s addictive game play offers simplicity and instant ticket gratification that is sure to rev up excitement for your players. 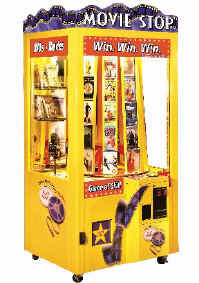 DVDs are here to stay, and no merchandiser displays DVDs like our award winning Movie Stop. Players simply decide which movie they want to play for and press the "Action" button when that movie lines up with the arrow on the control panel. For increased profits, fill your game with Play Station, Nintendo Game Cube, or Xbox video games. This Hasbro licensed game is the PERFECT addition to your game room with its familiar fast-moving, piece-popping fun! Players have a set amount of time to match the shape in the center screen. Once you find the match, push the large bubble button and don’t stop there! Try to match all the shapes before your time is up. Although it is geared towards the wee ones, this game is fun for all ages. 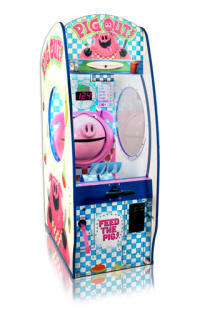 Have fun scooping different colored food into the bright pink pig’s gobbling mouth! Simply coin up and move the handle up and down to shovel dropping balls into the opening and closing pig’s mouth. This exciting kiddie game is designed for the little ones, but fun enough for everyone. As the popcorn overflows out of the kettle, the player tries to catch as many kernels as they can before time runs out. 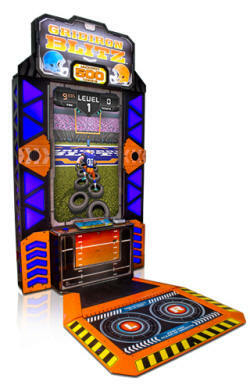 The classic theme, bright colors, and fun sounds will draw players in; while the action-packed playfield will keep them coming back. Piano Keys is an echo of the larger, two-player Grand Piano Keys. Beautifully in tune, Don’t miss a beat! Make sure Piano Keys is part of your game room! 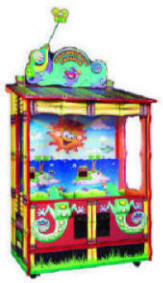 Pull My Finger is a bright and colorful ticket redemption game that encourages players to pull the monkey’s finger, plunging a ball onto the playfield. With six targets rotating ticket values, players need to aim and time their launch just right to win the big banana bonus! 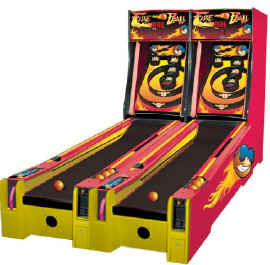 If the ball does not go straight into a target, automatic flippers have been installed on the playfield to keep the ball bouncing until it is launched into a target. Quik Drop's attention-grabbing cabinet and fast-paced, addictive game play will have your buckets overflowing with profits! 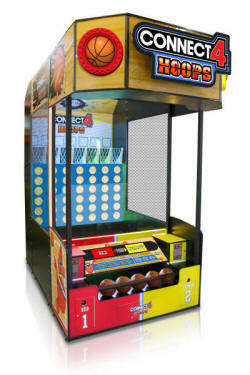 Baytek's latest mechanical play value game is sure to have players dropping by again and again as they skillfully try to land all 50 balls in the rotating buckets. Jump In! This Road Trip takes players through three great American cities, Chicago, Denver, & Hollywood, where players are offered prizes at each of the three levels for spinning enough miles! Step up and spin the wheel by simply pulling the handle up and giving it a big push down. When the wheel stops, players are rewarded with the mileage shown on the wheel. Scoring enough miles at Level 1 gives the players a choice to select a Small Prize or play on to Level 2 for the chance to win a Medium Prize. 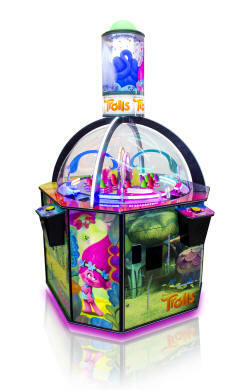 Win Level 2 and choose again, take the Medium Prize or play on to Level 3 where a player can win a desired Large Prize. Zoinks! Join the crime-solving gang with this animated wheel game, licensed by Warner Bros. Entertainment. 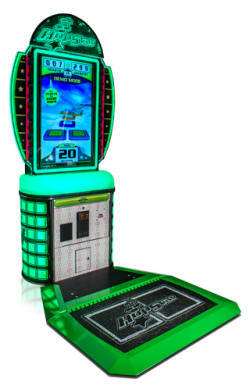 Players step up, pull the handle and watch the side rails light as the wheel spins. Where it skillfully stops determines how many tickets are rewarded! Toss or bounce balls into the 10 targets, trying to turn off all the lights! Sink a ball in each target in as few as shots as possible...the fewer shots you take, the more tickets you win! 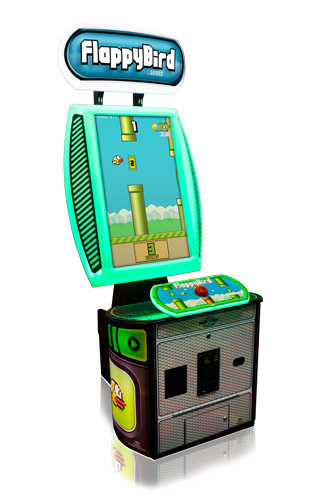 Each Sink It cabinet includes a 22" flat screen monitor for advertising, game play instruction and in-game graphics. The Shootout option adds two-player functionality and an eye-catching, glowing marquee. 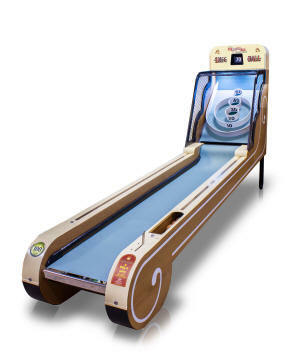 For that special touch of nostalgia, Skeeball Classic provides its traditional game play with the industry standard 10 foot ramp. Link up to 12 alleys and add a Deluxe Marquee to finish off the look, drawing in players of all ages. 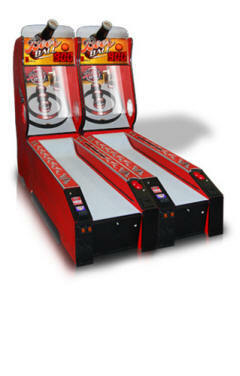 Your beloved Skee-Ball Alley is 100 years NEW! Meet the beautifully crafted centennial alley, designed specifically for the home market. With a 1930s-styled exterior and a 21 st century interior this alley is both an enthusiast’s and a collector’s dream. 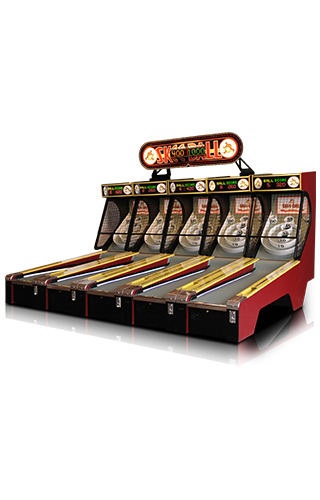 Skeeball is loaded with new features that make the games look great and function effortlessly. 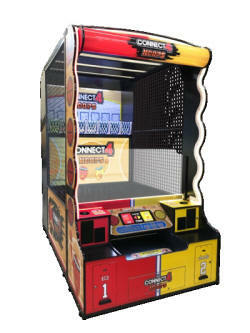 The classic game play brings nostalgia to your game room, while the sleek, modern design powers it into the future. 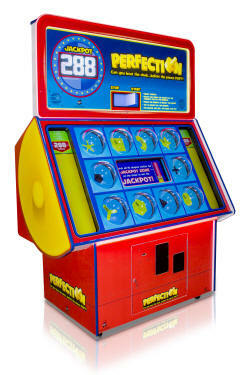 Aim high with this outstanding coin-operated game. 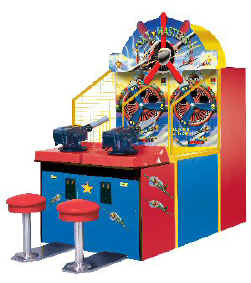 To play this game, the player must shoot as many targets as possible in the allotted time to win tickets. Built-in point multipliers are sure to attract the skilled player. Bay Tek’s shooting games require one air compressor for each 2 player game with a minimum air pressure of 85 psi, Bay Tek recommends a 20 gallon tank. A long time favorite of players and operators. Players race coins down the ski jump ramp in an effort to hit target slots in a rotating wheel. This game uses a unique ticket multiplier to reward both the novice and skilled players. Operators distinguish Smokin Token as one of the great redemption success stories, and are now able to share in that unprecedented success for yet another generation. 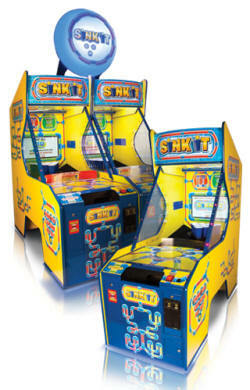 Smokin Token Extreme™ is a dual player, addictive quick coin game for all ages. Players release tokens down a slope into a spinning wheel. The player begins by shooting a ball to a spinning ring of Speed Demons. Landing on a Speed Demon will advance the player to the exciting second level of play. 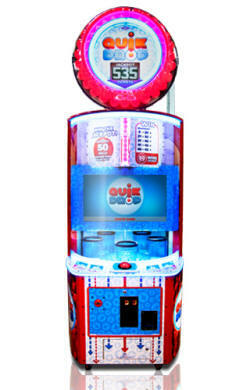 This is where the player earns their chance to win the ultimate jackpot of tickets. Pull the handle and watch the lights go around the bright, colorful 6-foot dial. Hit STOP at just the right time to win big tickets! It's fun, easy, and exciting for players off all sizes. Credit up and count down to the drop of 18 red balls into the squiggly playfield. 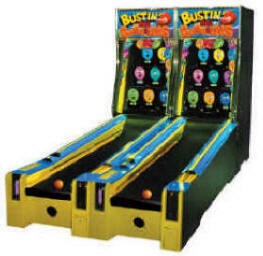 Time the drop of your yellow ball just right, and hit the big glowing button to release it! Win points according to where your ball lands in the mix— aim for the bonus spot! Don’t worry… a do-over is allowed if you miss completely. 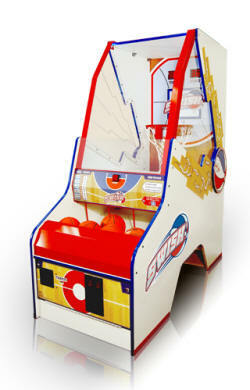 The fast-paced kiddie basketball game, Swish encourages players to shoot and score as many baskets as possible in the time allotted. Hurry, in the last ten seconds each basket is a three-pointer! Whether they are competing against friends or aiming for their personal best, Swish builds excitement and encourages repeat play! 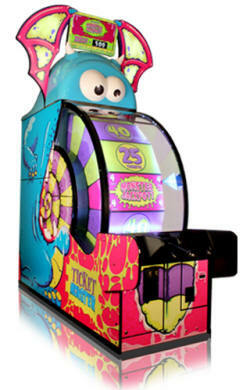 The sounds and graphics of Ticket Monster make this game grab attention from players all over the room. 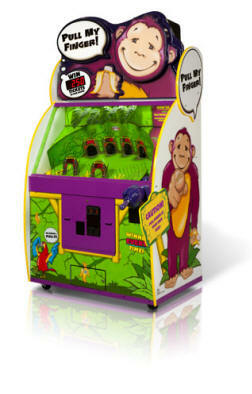 Ticket Monster also has dual ticket dispensers for more capacity and quicker ticket dispensing. Operators will be happy with how user-friendly this Monster's menu is to use. Fun for all ages, this 100% skill-based, 4 player game is simple to play. 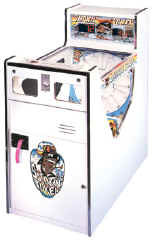 Players push the button to engage the sweeping arm in an attempt to try to knock off the tower of tickets on the revolving playfield. Skillfully players have to time it just right to win the novel tower of ticket bundles worth various ticket values. Bright colors and beautifully lit this game is a great addition to any game room. The winner beacon will create more players as it goes off celebrating with the winner. 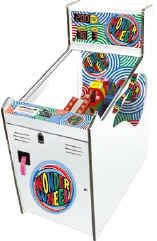 Players simply drop coins, which are propelled up the power ramp and into the wheel of wonder. Timing the drop just right will win big-ticket prizes. Wonder Wheel is challenging enough to bring them back time and time again.